Brazil needed two injury-time goals to defeat a dogged Costa Rica on Friday as Philippe Coutinho and Neymar scored to put the five-time World Cup winners back on track for the last 16. The Brazilians looked to be heading for a second frustrating draw in a row before Barcelona forward Coutinho poked the ball through Costa Rica goalkeeper Keylor Navas' legs in the 91st minute in St Petersburg. Neymar, who had a penalty award ruled out by referee Bjorn Kuipers after he consulted the Video Assistant Referee, volleyed in the second goal seven minutes into injury time. It was the latest strike in World Cup history. The world's most expensive player slumped to his knees in tears at the end and later posted a message on Twitter and Instagram hitting back at criticism of his emotional reaction. "Not everyone knows what I went through to get here. Even parrots can talk, but walking the walk... not everyone does it. 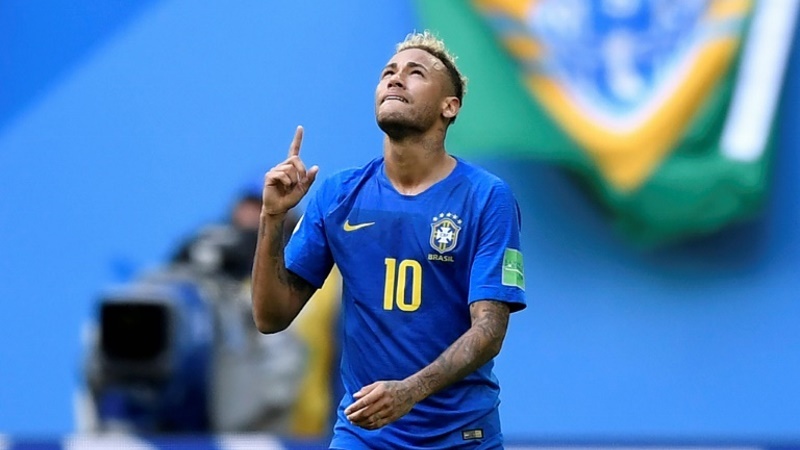 I cried out of happiness, overcoming, grit and desire to win," Neymar said. It was only Neymar's fourth competitive match since breaking a bone playing for Paris Saint-Germain in February. In stark contrast to Brazil's relief, Argentina and the under-performing Lionel Messi were in disarray following their shambolic 3-0 defeat to Croatia on Thursday. The Argentina management was forced to deny stories that the players wanted coach Jorge Sampaoli sacked before their final group game against Nigeria -- they said the claims were "absolutely false". Adding to the acrimony, several Spanish media outlets reported on an audio recording of former Argentina international Diego Simeone in which he lambasts the "anarchy" in the team and says he would choose Portugal's Cristiano Ronaldo over Messi, if he had the choice. "Messi is very good, but it is clear that he is very good because he is surrounded by extraordinary players (at Barcelona)," said Simeone, who now manages Atletico Madrid. "The question I ask is 'if you have to choose between Messi and Ronaldo in a normal team, who would you choose?'" Argentina's uphill battle to qualify for the knockout phase may however have been aided by Nigeria's 2-0 win over Iceland on Friday that leaves Group D intriguingly poised. A defeat would have put the Super Eagles out of contention, but Ahmed Musa struck twice to become the first Nigerian player to score at two World Cups and give his country just their second win in 14 games at World Cup finals. That sets up a showdown between Nigeria and Argentina in Saint Petersburg on Tuesday. If Argentina win they still have a chance of finishing second behind the already-qualified Croatia and reaching the knockout stage. In Friday's late game, Switzerland came from behind to beat Serbia 2-1 thanks to Xherdan Shaqiri's 90th minute long-range thunderbolt to move level with Brazil on four points in Group E.
It was a poignant victory for Shaqiri and fellow Swiss goalscorer Granit Xhaka, who along with team-mate Valon Belrami were booed relentlessly by Serbia's fans because they have roots in Kosovo, a former province of Serbia whose declaration of independence Belgrade refuses to recognise. Both Shaqiri and Xhaka celebrated their goals by hooking their thumbs and hands together in a 'double-eagle' celebration, a gesture representing Kosovo's flag. "You can see what I did, it was just emotion," he said. A win in Kaliningrad would have guaranteed Serbia a place in the knockout stage for the first time since becoming an independent nation, regardless of their result against Brazil in the last group game. Aleksandar Mitrovic gave Serbia the perfect start after five minutes, but the Swiss gradually worked their work back into the game in rainy Kaliningrad. The Swiss now face Costa Rica on Wednesday when a draw would be enough to send them into the knockout stage. Serbia face a more daunting challenge against Brazil.